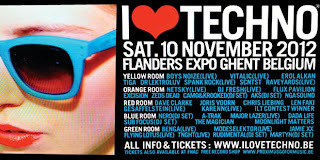 I <3 Techno, Europe's largest indoor festival, in Gent Belgium was the destination for my trip mid-November musical adventure. Boasting an incredible lineup, my expectations was high. Upon arrival at the expo center, the 35.000 people was dealt with very efficient with nearly no queue time anywhere. The place was huge with a gigantic central hall (with and embedded scene in the middle of it) and large rooms in each corner with each their genre. 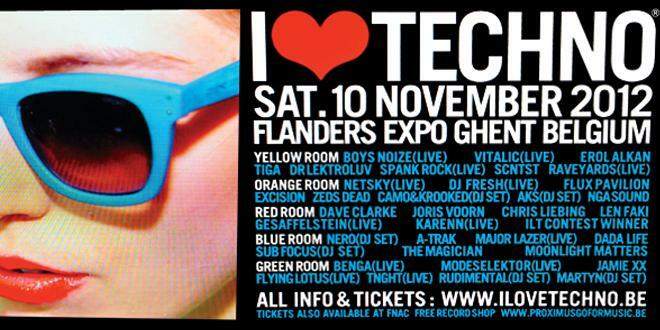 The amazing lineup (see picture to the right) in the five giant rooms of the Gent Expo Center meant you had to choose between the giant EDM buffet. As the place was huge, you wouldn't like to spend a lot of time walking between the halls, so we opted for at first stop in the dubstep hall, with Netsky, Flux Pavilion, Excision, Zeds Dead, Camo & Krooked and more. We headed straight for the huge dubstep room to catch Flux Pavilion, one of my long time UK dubstep favorites. I've seen him before at a small venue in Copenhagen with Feed Me and at UMF last year in Miami back to back with fellow Circus Records associate DJ/producer Doctor P. We managed to catch a couple of his great tracks like I Can't Stop and Hold Me Close before we had to head for the Blue Room for some progressive house. The Swedish nut-jobs Dada Life, as I last saw on UMF 2012 in Miami, is always good for a party complete with singalong rave anthems, blow up bananas and champaign popping. Only one half of the duo was present but he did his best. It's clear, that they are not the best DJ's on earth technically, but they sure know how to party. Don't forget to subscribe to their podcasts on iTunes. Canadian born and former world 5 x DJ world champion (he won the first at age 15! 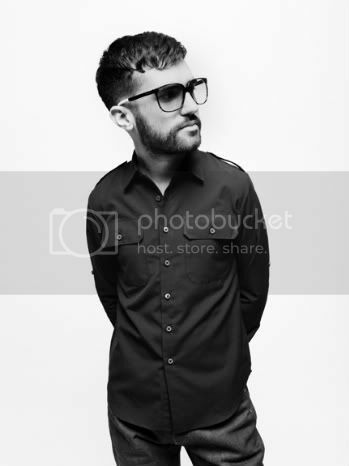 ), owner of Fools Gold Records and one half of Duck Sauce played a great set, not only with the usual prog house suspects (like Dada Life plays), but with regular house and even some disco elements. The contrast to Dada Life was immense. It was clear that we were dealing with a top skilled DJ and not just "button pushing party monkeys. Don't get me wrong, I love Dada Life for their music and their party skills, but they are not brilliant DJ's on a technical level. Now this is where the party got started! The Major Lazer crew, including Diplo and the Jiollionaire and the decks, plus two dancers and a hype man didn't waste any time and kicked off the party with their own brilliant tracks intermixed with dancehall, moombah, trap, quirky sound bits, samples and vintage records. I saw them in Copenhagen in the fall, so I expected a show complete with CO2 cannons and Zorbing and they didn't disappoint. Nero is definitely in my personal top 3 and as I haven't seen them live yet, I was really looking forward to finally seeing them in action. Like no others, they produce a very atmospheric and melancholic soundscape you can dream away into. Nero was for me to peak of the festival playing a set of dubstep, electro house and drum 'n bass with their own stuff mixed with other great tracks from Knife Party etc.. I'm really looking forward to their new album during 2013 and hopefully they will magically appear in on the UMF 2013 lineup in March.